We all know the iconic diamond shape. Its rounded circumference with a flat top, tapered base, and angled cuts. It is a symbol of elegance, wealth, and power that is recognized internationally. But a diamond can come in way more than just one shape. For many people, the uniqueness of a shaped diamond is infinitely more meaningful than choosing a diamond that looks the same as everyone else has. Many pendants, necklaces and broaches use diamond shapes to define the jewelry itself, rather than just setting stones to accentuate a piece. A beautiful pear drop diamond can look beautiful by themselves in an earring, whilst a large emerald cut will often be surrounded by other smaller stoned to accentuate its beauty. The shape of a Diamond doesn’t often have a real impact on the value of a stone. The value is measured instead by clarity, the quality of the cut, and its weight. However, prices will often vary in line with fashion and popularity. The shape of the diamond you choose is normally determined by the shape of the original stone. A craftsman will always attempt to make the largest diamond (or diamonds) possible from each stone. 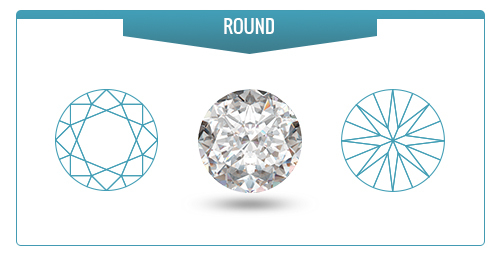 Larger diamonds are exponentially more valuable than their smaller counterparts or equal quality. For this reason a single 10 carat stone is worth much more than two five carat stones. There are a vast number of diamond shapes to choose from, and the shape itself can vary slightly depending on the cut. But you will generally find these styles from a high quality jeweler. The round brilliant diamond is one of the most popular shapes of diamond around, and the style you see characterized most often in movies, magazines and even brand logos. The round brilliant style has a 58 facet cut that makes it one of the most beautiful around, with the greatest shine and inner reflections. The majority of diamonds sold are shaped and cut using the round brilliant design simply because it gives the diamond the very best sparkle. The downside is that because it is so common, it is also a little less unique than many other diamond shapes, but still one of the best! 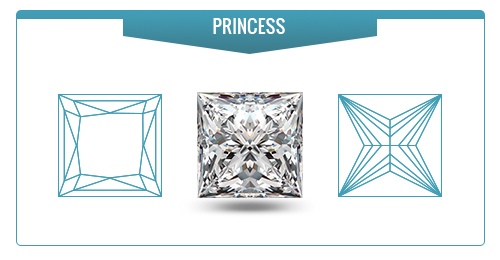 The Princess diamond shape is a more modern cut, but also a popular one, especially for engagement rings. Princess diamonds are generally square, sharp and angular, which gives them a striking appearance, perfect for the future bride who is looking to show off a new ring on her finger! The angular look of a princess diamond is perfect for a ring setting, since the roundness of the ring provides a steep contrast to the diamonds shape. The best princess cuts are a perfect square, but some do have a slight elongation. Generally if a Princess shaped diamond ‘looks’ square it will have close enough of a 1:1 ratio to be square. 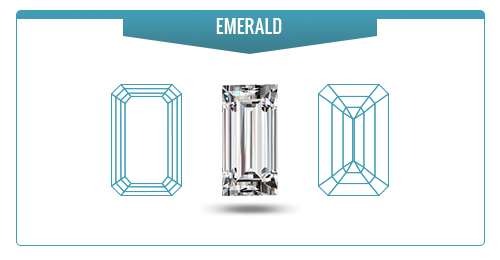 Emerald shaped diamonds have a softer look than the Princess cut, and a more elongated rectangular shape. Emerald cut diamonds have a distinctive stepped pavilion and large top that creates a unique look compared to nearly any other style of diamond. The emerald style is often used as a centerpiece in ornate jewelry thanks to its luxurious wealthy look. The Emerald cut can also be found as a perfect square, which is known as an Asscher diamond. Oval diamonds are similar to round diamonds but their shape is a little squashed. A well cut oval diamond will be evenly shaped but elongated. Ideal oval shaped diamonds have a ratio of 1.33 and 1.66, although it is not uncommon for cuts to be longer or squatter than the standard ratio. The Emerald cut can also be found as a perfect square, which is known as an Asscher diamond. With a similar stepped cut, it retains the traditional look and feel of the emerald. 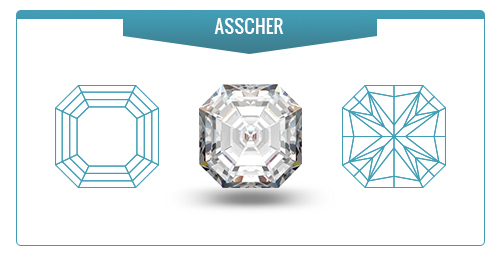 Unlike the emerald cut however, the Asscher square emerald cut makes it a slightly cheaper option for a diamond ring. A radiant diamond can actually appear in a variety of shapes, though it’s most common shape is rectangular. 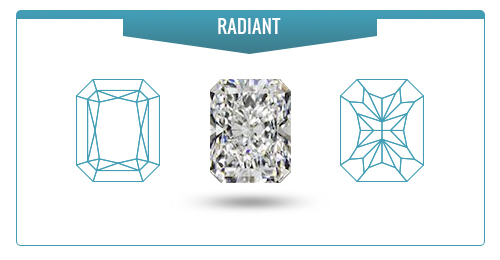 Radiant diamonds are particularly well known for their exceptional looks and brilliant reflections. The Marquise style is similar to the oval style of diamond although little more elongated (having around a ratio of 1.75 to 2.25. However unlike the oval style, its furthest ends are distinctly pointed. Like the Princess style, the Marquis diamonds are accentuated by their angles, and have a wonderful eye catching appearance. 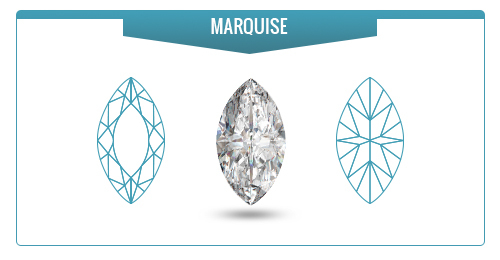 Marquise style diamonds are often used in jewelry for this reason. 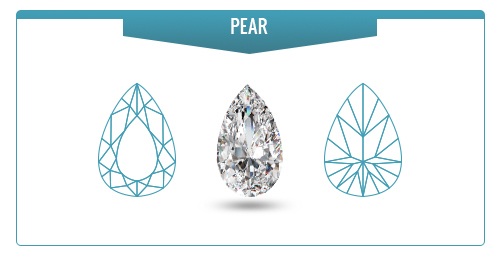 The pear shaped diamond is another classic cut that is extremely popular in earrings and pendants. It’s teardrop shape is elegant, and it’s eye-catching shape makes it a beautiful stone to have in jewelry by itself, or as part of a larger jewelry design. It’s said that nothing is more romantic than a diamond. It is an everlasting token of love that really will last forever. A heart shaped diamond adds even more love to this beautiful stone with a symbol that is internationally recognized. 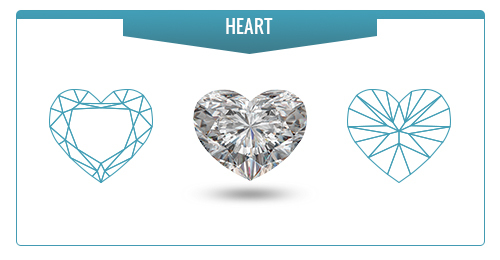 Heart shaped diamonds are the perfect way to show your love, but it’s more than just a gimmick. 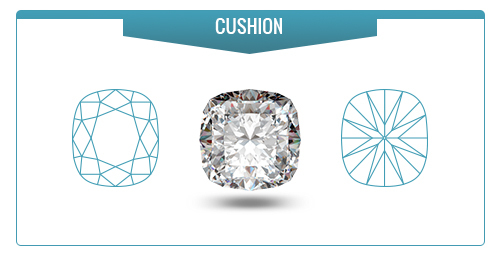 The Cushion shape is a great combination between the round diamond and the princess diamond. It generally still has a square or rectangular shape, but with beautifully rounded corners. The Cushion style is one of the classic diamond cuts, which makes it highly popular in jewelry design, and can be found in many antique diamond jewelry pieces. 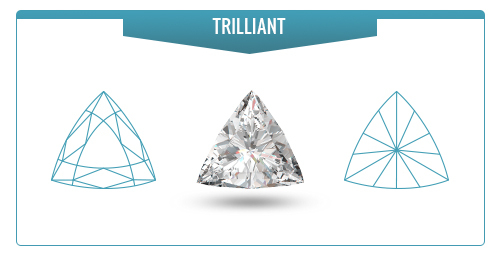 Trilliant diamonds are one of the few diamonds that are cut in to a triangular shape. Their shape is uncommon, as its cut generally leads to more wastage. This makes them an ideal diamond shape for anyone who is looking for a stone that is just a little more unique than normal. Trilliant diamonds are most often used as a centerpiece in rings, but also find their way in to more expensive jewelry.